After being controlled for more than 3 years by the so-called Islamic State of Iraq and Levant (ISIL), the town of Ana in western Anbar was retaken by Iraqi Security Forces (ISF) in September 2017. Early REACH reports of the situation in western Anbar indicated limited access to food and lack of livelihood opportunities. 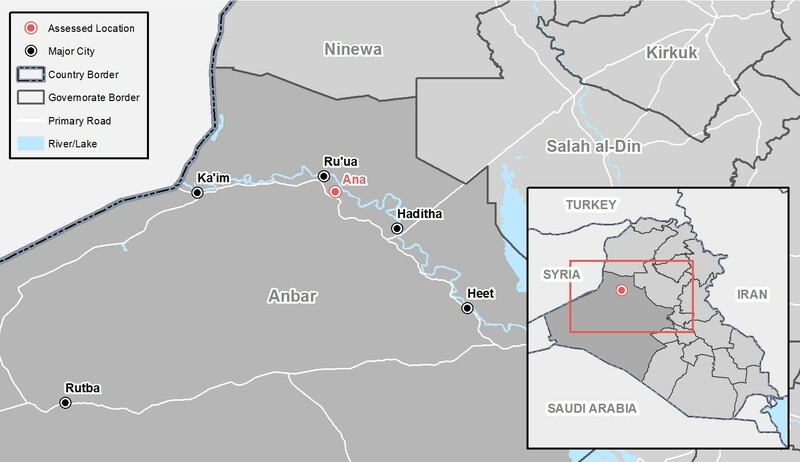 REACH, in partnership with the Iraq Cash Working Group (CWG), conducted a Joint Rapid Assessment of Markets (JRAM) in Ana town in an effort to support humanitarian actors in determining if cash and market-based programming are feasible in this context. Data was gathered in November 2017 from retailer, wholesaler, and consumer Key Informants (KIs) connected to Ana’s market place, looking at the price and availability of goods as well as traders’ capacity to respond to a potential increase in demand. In terms of the impact the crisis had on the market, findings show that damage to electricity and communication infrastructure had a greater impact on businesses compared to water or road infrastructure. Regarding security issues, check points were reported only by a minority of retailers (38%) and close to half (45%) of wholesalers. The vast majority of consumers (97%) reported not facing any physical barriers, including security, in accessing the market places. Contrasting findings were reported regarding the impact of the crisis on the supply chain: 71% of retailers reported that the number of their wholesalers decreased since before the crisis, whereas 64% of wholesalers reported an increase in the number of their suppliers. This can be indicative of a disparity in supply chain between retailer, who source their products within Ana, and wholesalers who are able to source outside the district. Assessed goods were widely available in the market place, with the exception of kerosene and butane, which are sold by mobile vendors and sanitary napkins which were not available at the time of data collection. Despite the only recent cessation of armed conflict and the town’s relative isolation from large population centers, prices were found to be only 7% higher than the average price across northern and central Iraq for November 2017. Moreover, findings also highlight a significant confidence expressed by both retailer and wholesalers in their capacity to respond to a 50% to 100% increase in demand. Overall, the study suggests that any programming leading to cash injection could be absorbed by the local market without posing any threat to its function. The JRAM will continue to be implemented by REACH and the CWG, providing robust and harmonized market data to cash actors in Iraq with the next round focusing on Hawiga. Access the Joint Rapid Assessment of Markets (JRAM) here and the earlier Rapid Humanitarian Overview here.